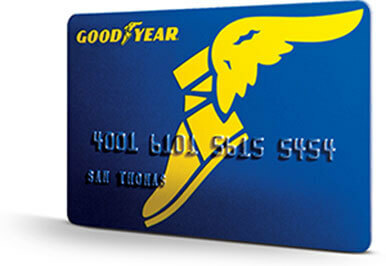 With credit approval for qualifying purchases made on the Goodyear Credit card at participating stores or on goodyear.com. As of October 2, 2018, purchase APR 30.49%, cash APR: variable 29.99%. The cash variable APR will not exceed 29.99%. Minimum interest charge $2.00. Cash Advance fee is the greater of $10 or 5% of the amount of the cash advance. Offer is only valid for accounts in good standing; is subject to change without notice; see card agreement for details. Purchases made on the Goodyear Credit Card are subject to credit approval. The Goodyear Credit Card is issued by Citibank, N.A. Goodyear Credit Card transactions: the terms of the offer, Card Member Agreement, and applicable laws governs this transaction including increasing APRs and fees.